Tomorrow, the UN's International Atomic Energy Agency will release a controversial report about Iran's nuclear program. This report nearly marks the end of 12 years of service by director-general Mohmaed ElBaradei, who, in a few months, will pass the torch to Yukiya Amano. But, curiously, there is little out there about Amano. Yesterday's WSJ story only mentioned the Japanese diplomat in passing and a related NYT piece completely failed to name the man who will lead the UN's nuclear policy for at least the next four years. So who is Yukiya Amano? The 62-year-old technocrat was born in Japan in 1947, just two years after the nuclear incidents that have inspired his life's work. He graduated from Tokyo University Faculty of Law in 1972. After graduating, he joined the Japanese Foreign Ministry and steadily made his way through the bureaucracy, picking up credentials and leadership posts in disarmament and non-proliferation fields, interspersed with stints at various embassies across the world. Despite the breadth of his experience (including a year as the chair of the IAEA's policy-making governor's board) and a role in several important nuclear non-proliferation deals (such as the 1995 extension of the Non-Proliferation Treaty and the 1996 Comprehensive Test Ban Treaty), his resume seems void of any true landmark accomplishments. As New America's Jeff Lewis told me, "He's not really know for anything policy-wise." 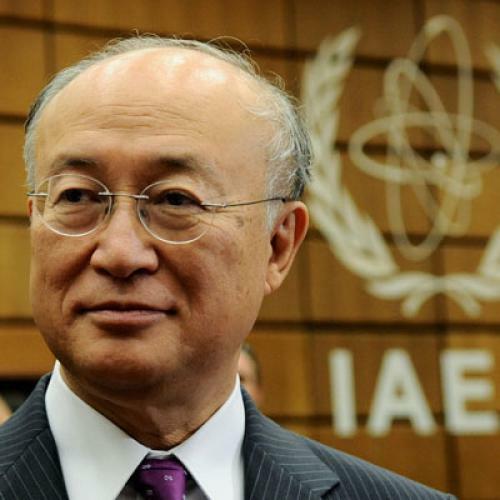 Last month, after nearly four years with the IAEA, Amano was officially appointed the new director-general of the U.N.'s International Atomic Energy Agency. His two-thirds majority victory over South African diplomat Abdul Samad Minty was accomplished by just one vote after the original director-general vote in March proved indecisive. While he was a favorite among developed nations, he clearly fails to hold a popular mandate among the 35 member nations. When he starts his four-year term on December 1, not only will he have to deal with several fragile nuclear situations, but he will also have to deal with a genuine and seemingly irreconcilable rift within the agency between developed nations (which are generally more concerned about non-proliferation) and developing nations (which feel underrepresented and are interested in the development of nuclear energy). Amano will have to grapple with the legacy of his predecessor, ElBaradei. The controversial director-general developed what some call a "messianic" role as director-general, particularly after the Nobel Peace Prize, and he attempted to expand the mandate of the IAEA to problems that went far beyond its scope, such as conciliation in the Middle East. The board, or at least the developed nations, is looking for Amano to take a step back. So in Amano, we see a low-profile diplomat with an apparent aversion to risk--someone who can restore a narrower scope of activity to the agency. While his life's work has been dedicated to disarmament and non-proliferation, he has, since being elected, "tried to reassure member states that didn't endorse him that he would heed their interests and that he wouldn't emphasize the nonproliferation agenda of advanced nuclear countries to the detriment of other states' development goals." Given his reportedly positive feelings about Barack Obama, we can also expect someone who will work with the U.S. more willingly than ElBaradei worked with President Bush. With all that is at stake, it is hard to tell at this point where Amano will take the agency. Even if he can succeed in refining the agency's mission and achieving small diplomatic successes in some of the world's more volatile locales, his most difficult task may be back in the agency's conference room. Lewis was skeptical that any director-general could bridge the immense distrust between the agency's two factions, since ultimately it's the member states that have to decide to work in cohesion. But, he said, "I don't have any particular reason to think Amano can [mend the rift]. He's not superman."